Gibraltar was seized in 1704 by the British as part of its operations against the French in the War of the Spanish Succession. The goal of the war was to prevent the French from inheriting the Spanish throne in addition to their own considerably wealthy kingdom. The British and their Dutch allies were planning to enter the Mediterranean sea in an attempt to apply pressure on the French to the South and to get the French to divert some of their naval resources from the Atlantic and the Caribbean. It was hoped that they could form a bridgehead somewhere in Southern Spain in order to advance on Madrid. In May 1704, Admiral Rooke took 30 English ships and 19 Dutch Ships of the Line into the Mediterranean. Additionally, they carried 2,400 marines who were to be commanded by Prince George von Hesse-Darmstadt who was the Queen's cousin. They were going to attempt to seize Nice but diverted themselves to Barcelona instead. They did capture this city but were to abandon it shortly afterwards. They then heard the disturbing news that the French Brest Fleet had entered the Mediterranean seeking to rendezvous with the Toulon fleet which would have created un unassailable combined strength of some 95 ships of the line. The British and Dutch fleet needed to find a safe anchorage West of Toulon in order to plan their next move. They considered trying to take Cadiz but assumed that it would be very heavily defended. 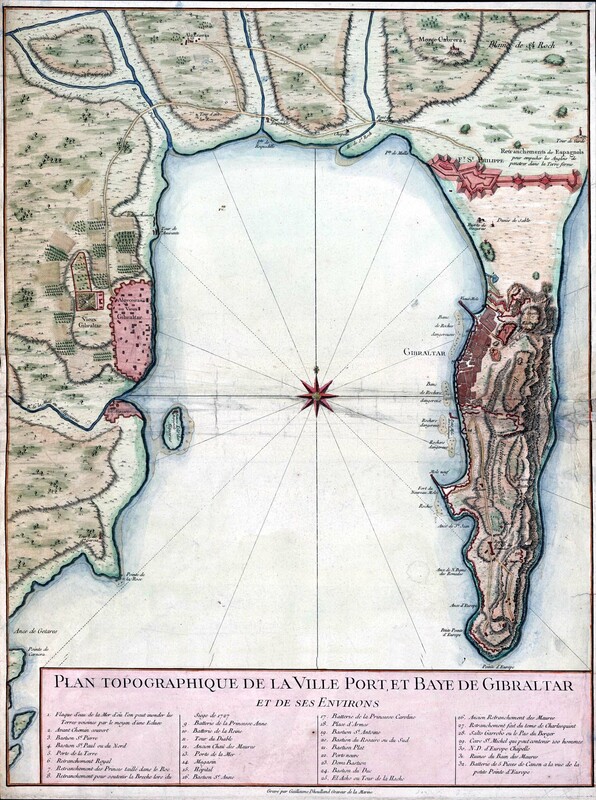 The Prince then suggested Gibraltar - it would be garrisoned but not to the extent that Cadiz would be. On August 1st, the fleet entered Gibraltar Bay. Boatloads of Marines were despatched to the Isthmus to close off the Peninsular. The Spanish Governor was asked if he would surrender in face of the overwhelming firepower at the British and Dutch command. The Spanish governor refused as a point of honour. A thunderous bombardment commenced on August 3rd against the Spanish garrison. The overwhelming gunfire was quickly followed up by the marines who swarmed into the devastated Spanish batteries and defences. It was all over by nightfall. The Spanish requested a three day grace period to tend to the sick and wounded. On August 6th the Prince claimed the port - but not for England - but for the Austrian Charles of Habsburg who was the candidate the English were backing for the Spanish throne. In the aftermath of the battle, the Protestant British and Dutch treated the local Catholic population brutally and harshly. Churches were ransacked, property was looted and women were raped as officers lost control of their troops. Utterly traumatised by these events, the population fled into exile, many of them setting up a new version of the town in nearby San Rocque. Indeed, San Rocque still has the ecclesiastical and civic records from the original Spanish settlement in Gibraltar. The seizure of Gibraltar allowed the English and Dutch fleet to meet the French off of Malaga on August 24th. After a hard fought battle in which the English virtually ran out of ammunition, the two fleets broke off from one another. Although technically a draw, the result went hand in hand with the land victory at Blenheim on the very same day. These combined results were a serious setback for the French backed candidate. The war would drag on for another 8 years before the Treaty of Utrecht in 1713 would finally close the conflict. It was to be this Treaty that would formally cede Gibraltar (along with Minorca) to the British in perpetuity. This would give the British a permanent base in the Mediterranean for the first time. With the Spanish population virtually eliminated from the colony, a fresh population was imported from a variety of trading and maritime ports. In particular settlers came from Britain, Genoa and Sephardic Jews - these would later be joined by Maltese. The welcoming of Sephardic Jews was particularly resented by Spain as they had specifically included a clause in the Treaty of Utrecht to ban the settlement of Jews in Gibraltar. Over time, this non-Spanish population would evolve an identity that was more closely tied to the fortunes of the Empire's maritime fortunes than in wishing to be re-united with Spain. Suspicion of Spain would be further tested with attempts by the Spanish to recapture Gibraltar in 1727 and then again in 1782 during the American War of Independence. Spain considered swapping the island of Puerto Rico in 1783 but finally changed its mind. The British victory at Trafalgar in 1805 would cement the security and indispensability of the port to Britain's burgeoning Twentieth Century Empire. There would be no more attempts to seize Gibraltar by force and none even considered until the Twentieth Century. In the Nineteenth and early Twentieth Centuries, the voyages to India became a part of British folklore. After the Bay of Biscay ships would round Cape Trafalgar and 'the first stop would be the Rock fortress of Gibraltar, shaped like a lion, guarding the narrow entrance to the Mediterranean. For a few hours the passengers would slip ashore. Military regulations prevented them sketching or taking photographs, but they could look at the monkeys climbing over the rocks. The legend was that so long as the monkeys stayed in Gibraltar so would the British. Gibraltar, Malta and Cyprus would provide the three key naval bases which allowed the British to dominate the Mediterranean so thoroughly. Gibraltar was 'the only British colony which was part of the mainland of Europe; it was a tiny peninsula on the southern tip of Spain. In area it was less than two square miles, but it had a good harbour and it commanded the narrow channel, only 20 miles wide, connecting the Atlantic to the Mediterranean. By 1918 the 20,000 inhabitants, of mixed British, Spanish and Maltese blood were happy with their political condition. The Gibraltarians made a good living out of the British garrison, the Royal Navy and merchant shipping. Spain however persistently insisted that Gibraltar was really Spanish territory and from time to time demanded that the British should give it up. 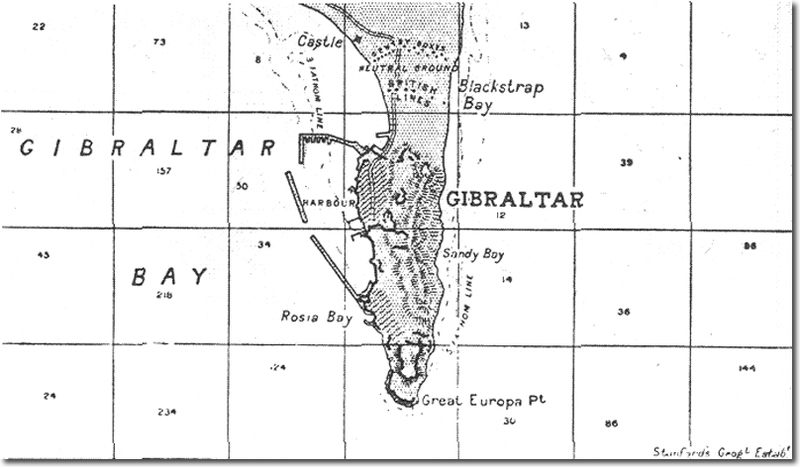 The Gibraltar question formed a minor but lasting problem in European diplomacy and meant that Britain and Spain were suspicious of one another for long periods of time. The Spaniards could do little to enforce their demands and were incapable of challenging the Empire at its peak. Nonetheless the British took care to keep Gibraltar well-garrisoned. The Rock of Gibraltar, honeycombed with fortifications and with monkeys scrambling over it, was one of the prime symbols of the British Empire. With the outbreak of the Second World War Gibraltar became a major naval refuelling and supply port. However, following the German occupation of France, a real threat arose that Hitler might, with the co-operation of General Franco, attack and take over Gibraltar. This was no idle threat as Vichy planes from North Africa bombed the colony in 1940 after the Royal Navy had sunk much of the French fleet at Mers-el-Kebir in Algeria. Gibraltar was put onto a full war footing: all local wives and families were evacuated and substantial military units were moved in. The existing tunnels within the Rock were greatly extended and developed so as to provide safe accomodation for Service personnel, hospitals for the wounded, storage of weapons and ammunition, and HQ and signal facilities for all. The extension of the tunnel network finally led to some additional 50 miles of tunnelling being provided much of it accessible to vehicles. At the same time a massive airfield was built adjacent to the Spanish frontier and extending into the sea on the western side, with rock excavated from the tunnel network being used for reclamation. The airfield became an important R.A.F. base in addition to its crucial naval role. The Germans discussed with General Franco the possibility of Nazi troops seizing Gibraltar and returning it to Spain. However, Franco did not wish to be dragged into the war and also was suspicious of the motives of the Third Reich. He did not want to give the Germans an excuse to march through Spain and so resisted the temptation. There were in fact rumours that the British hinted that they would return it to Spain in return for Franco's neutrality, although this has never been confirmed. Gibraltar played a key role in prosecuting the Atlantic War and in helping keep the strategically important island of Malta resupplied. With the Americans joining the Allied war effort, Gibraltar became an important base for Operation Torch, the US invasion of North Africa in November 1942. General Eisenhower had his headquarters in one of the tunnel complexes. By this time, it was clear that the Axis threat to Gibraltar was no longer a reality. With the end of W.W.II considerable housing developments took place, as the evacuees returned to Gibraltar, and various old military barracks were made over for civilian use. As World War gave way to Cold War it became necessary for a considerable naval, military and air presence to be maintained. The NATO HQ for the Mediterranean area was set up in the Rock tunnels, and a permanent British Regiment was stationed at Gibraltar. Naval facilities were maintained and included a sound surveillance system over the Straits. Likewise the R.A.F. base remained and included, in co-operation with the Cyprus base, radar and communications surveillance over the Mediterranean. However, it was to be the Cold War that gave the greatest threat to the British presence in Gibraltar. The US was looking for its own version of a Gibraltar port for its Sixth Fleet in the Mediterranean. The anti-Communist credentials of Franco could not be faulted and a joint US/Spanish port and airbase was constructed at Rota some 60 miles North West of Gibraltar in the 1950s and a series of pacts and trade deals were signed between the US and Spain. Queen Elizabeth II travelled to Gibraltar for its 250th anniversary in 1954. Franco, emboldened by his new acceptance by America, felt confident enough to up the pressure on Britain. He used the visit as an excuse to close its consulate in Gibraltar and introduced border restrictions. Britain was having to come to terms with its own dimunition of power. This would be confirmed by the Suez Canal Crisis in 1956 which severely dented Britain's military and diplomatic credibility in the Mediterranean. Franco took his claim on Gibraltar to the United Nations which agreed to back its claim in the General Assembly. Britain's response was to empower the Gibraltarians by giving them a constitutional veto on the issue of its return to Spain. This was technically an amendment to the original Treaty of Utrecht. Originally, Britain had sole control over the sovereignty of the Rock but now it had joint sovereignty with the population of the Rock. This granting of a veto further infuriated Franco who responded by colosing the border and severing all communications links between Spain and Gibraltar. This would last for 13 long years. In 1973, Britain joined the EU and as a dependent territory, Gibraltar did also. Spain would not join until 1986. Tensions have relaxed between Spain and Gibraltar in recent years. Gibraltar is part of the South West Constituency in the European Parliament. Despite the less bellicose relationship, the Spanish would still love to see the Rock returned to them and still test the territorial integrity of waters around Gibraltar. "Do you approve of the principle that Spain and the United Kingdom should share sovereignty over Gibraltar?" Just 187 people voted Yes, whilst 17,900 voted No. This 99% majority demonstrated that the population was yet to be convinced of the merits of changing the status of its sovereignty and of exercising their veto rights gained in 1969. In many ways, Gibraltar is probably the most significant remaining dependent territory for the British. It still holds a strategically vital position and it still maintains port and airfield facilities and can monitor flows of shipping into and out of the Mediterranean.